There are a lot of people online giving out free advice (and occasionally, not-so-free advice) about how to learn a new language. Many of them are saying a lot of the same things. You'd expect that, right? Two people who know what they are talking about would generally say the same things if talking about the same subject. 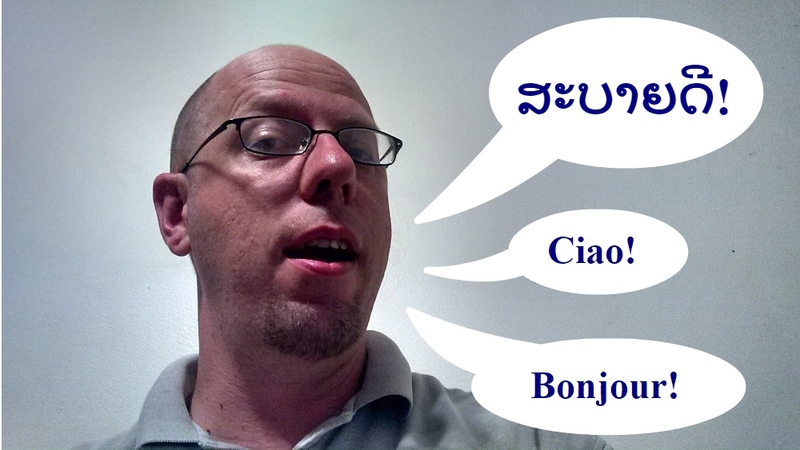 Hello in Lao, Italian, and French. In Lao it's pronounced Sa-bai-dee. One of the things I've seen several times from several different bloggers is this: focus on only one language at a time. And I believed them. But my experience during the past two weeks has me questioning this piece of advice. For a couple of weeks I was trying to study all 5 languages at once. I was having fun, but I wasn't getting anywhere. I decided I needed to go down to learning just one. I don't remember how German won, but for the next nine months until I started the Esperanto in Six Weeks Challenge, German on Duolingo was my language learning focus. And so, when I would read or hear people say to focus on one language at a time, that made sense. Fast forward to this month. I had completed the Esperanto challenge, and then spent the next two months focused on Lao. During that time I did have a couple of conversations in Italian and Spanish, but I only studied Lao until my self-imposed deadline on August 31st. Worried that I was going to forget other languages, and getting a little burnt out on Lao, I declared September to be Study-What-I-Feel-Like month. Lao would still be my main focus, but I could look at other languages, especially the ones I didn't want to forget, without feeling guilty about it. I seemed to be doing better at Lao than when I studied it exclusively. I don't spend very much time on other languages. One day I watched a couple of YouTube videos in French from Easy Languages, another day I watched a couple of videos in Italian from Luca Lampariello. Several times I reviewed some of the German I've forgotten on Duolingo. I don't think I spent more than 10 minutes a day on languages other than Lao. I didn't do any difficult studying in other languages. Just easy, short visits to other languages. My ability to recall and understand Lao words seems to be improved. I have two working theories. Theory One: A few minutes a day studying a language other than your main focus language helps you learn your focus language better. I'm not 100% sure if this is true or not, and if it is true, I don't know why it works this way, but this is the theory I'm choosing to believe at the moment. Maybe a few minutes a day on a different language is helping me exercise my language learning part of my brain. Possibly. Or maybe it's like stretching your muscles before or after you do a strenuous work-out at the gym. Theory Two: I'm just better at Lao because I've been trying to learn it for two months. I probably was at a "learning plateau" that I've finally gotten past, and now I'm at a part in my Lao studies where I'm learning faster for a little bit until I hit my next plateau. While I'm choosing to believe theory number one for the moment, theory two is quite possibly the correct explanation why I'm learning Lao better. Try it out. Spend a couple of minutes just barely stretching yourself with a language you already know and see if you think it is helping you learn your focus language. What if you are learning your first foreign language right now? Try a couple of minutes with an easy language. A couple of suggestions: Esperanto is fairly easy. And after spending about 10 minutes looking at Dutch on Duolingo, I thought to myself, "Hey, this is like German, but much easier." So if you are a native English speaker, you may want to give Dutch a try. You shouldn't pick a language that is too similar to your target language. For example, if you are studying Spanish and Italian at the same time, it would be really easy to get the two mixed up. For me, it would be a mistake to spend time on Thai, because it is so similar to Lao. If studying two languages becomes too confusing, come back to this article and leave me a note in the comment section about how wrong I am. Really, I won't be offended, as long as you're nice about it. I do want to re-emphasize that I'm not trying that hard at all on the second language. I'm trying hard at Lao. When I take a break from Lao to work on German, French or Italian, it doesn't matter to me much what I've learned or reviewed. Lao is still my main focus, and takes up most of my language study time. Am I fooling myself? Is theory number 2 more likely to be true than theory number one? Have you had a similar experience studying more than one language? Let everyone know in the comments. Your thoughts could help another language learner. I like theory 1 although I can see that theory 2 might be valid. I'm going to go with 1 because I'm working on Spanish and Irish at the moment and am finding that I remember a lot more Spanish than I thought I did and Irish is a lot of fun. Irish does sounds fun. I don't know that I'd have much use for it besides bragging rights, but I always thought it would be a language that would be fun to know. I really relate to this. I have my main language, Hebrew, that I'm hoping to improve to an advanced level, especially using massive (mainly comprehensible) input, my secondary language, French, that I'm brushing up, at the moment with Lingvist and radio/TV, and then languages that I just dabble with no expectations, just a few minutes a day, just for fun. I think that the reason you are feeling an improvement in your Laos, is because you let the language learning part of your brain relax. For various reasons, I can't concentrate at all, I mean nearly nothing, nada, zilch. Grammar explanations, drills, vocab lists and what have you just make my eyes glaze over. I'm not "working hard" at any of my languages. But I am enjoying them, both the ones I know and the new ones, relaxing and absorbing as opposed to learning. I'm also using Duolingo (Italian, German, Portuguese). I find it very intuitive, requiring very little analyis. I want to add a bit of Peppa Pig, which is how I found your site. This may seem a digression, but I think the point is to stop trying and relax and absorb. For me at the moment this is really my only option. But still I recommend it for others. I had an experience of mainly listening to a language for two months, with very minimal study, and then suddenly starting to speak. I think we need to try less hard and relax more. I loved your comments. It got me thinking some more on this subject. I think maybe some times when we are really trying hard on a language, we are only putting what we learn in our short term memory. I know sometimes I plow through some Anki flash cards in Lao, only to forget 90% of it by the next day. Thanks for your insights! Actually, I'm wondering if the difference you noticed is because you engaged in a different language or just did something you found relaxing. I wonder what would happen if you just learned Lao, and regularly did a non-language related activity you found fun. Anyway, I'm glad you liked my comment. HAPPY learning! Thanks, Alice, for the link to that article. It was an interesting read. I tried something new in the way I study last night. I studied Lao for five to ten minutes, and then put ten dirty dishes in the dishwasher. Then I went back to Lao for five to ten minutes and repeated the process. I think taking those breaks doing something non-cerebral like doing dishes made the process of studying Lao easier. I think I'll try it some more and see if I still feel that very short bursts of studying intermixed with something completely unrelated continues to help.